If you fit the bill (beer-less, party-bound girl) then last month's Gear Up bike flow chart in our Bikes & Beer issue led you to Maria Scati's fashion-forward and pedal-friendly messenger bags. The idea for the simple but chic bags was born one Christmas when Scati declared she would make, not buy her loved one's gifts. An aunt to five nieces, and a former fashion designer for Echo and Ralph Lauren, Scati had the audience and the know-how in place. Using her stock of collected vintage fabrics she created simple, laptop-sized bags for her two eldest nieces. The connection to Philly's biking culture began when Scati, an avid but accessory-free biker herself, noticed that the majority of the two-wheeled set chose to carry their belongings in nylon, industrial back-packs. Not impressed, she desired a fancier option -- a fashionable bike accessory that could be worn without really noticing it; something that would catch the eyes of passers-by, but wouldn't inhibit the rider herself. The style inspiration came from a bag Scati noticed a mail-carrier wearing while watching a European film, and from there she began creating her entirely handmade buckle-, zipper-, and ring-free creations with the hope that her bags would feel like part of a bikers body, allowing them to experience the feeling of freedom that can only be achieved weaving down urban streets on a pedal-propelled machine. 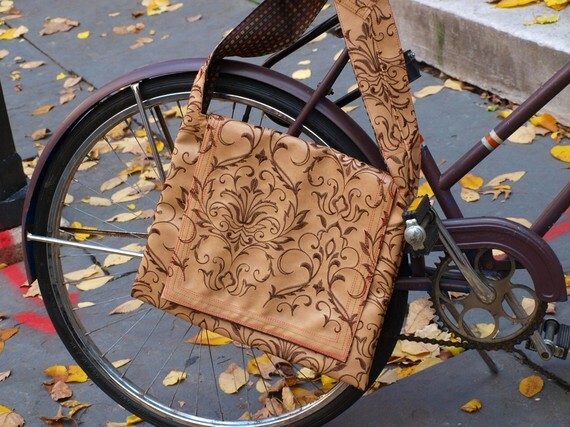 Scati's bags are available here in her online Etsy shop. Besides creating accessories for the bike riding fashionista, Scati owns E. Passyunk's Mr. Martino's Trattoria with her husband.